The Mathematics of Finance has become a hot topic ever since the discovery of the Black-Scholes option pricing formulas in 1973. Unfortunately, there are very few undergraduate textbooks in this area. This book is specifically written for advanced undergraduate or beginning graduate students in mathematics, finance or economics. With the exception of an optional chapter on the Capital Asset Pricing Model, the book concentrates on discrete derivative pricing models, culminating in a careful and complete derivation of the Black-Scholes option pricing formulas as a limiting case of the Cox-Ross-Rubinstein discrete model. The final chapter is devoted to American options. The mathematics is not watered down but is appropriate for the intended audience. No measure theory is used and only a small amount of linear algebra is required. All necessary probability theory is developed throughout the book on a "need-to-know" basis. 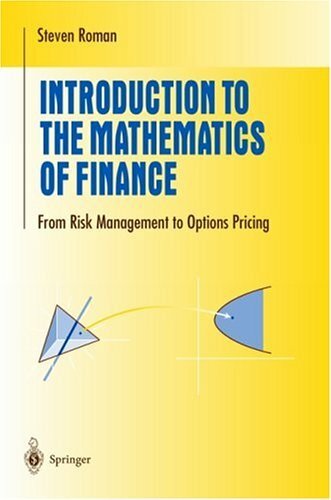 No background in finance is required, since the book also contains a chapter on options .